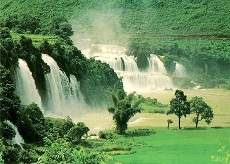 Bac Can is a mountainous province, sharing its border with Cao Bang Province to the north, Tuyen Quang Province to the west, Lang Son Province to the south-east, and Thai Nguyen Province to the south. The topography is mainly midland, mountainous. The province has a complex network of rivers and springs. Climate: There are two seasons: dry and cold lasts from April to October and hot and rainy from November to December. The cold season lasts longer in the north region. The annual average temperature is 25ºC. The annual rainfall is about 1,400mm - 1,800mm. The weather has drizzling rain and high humidity in March, April and August. Bac Can has natural of mineral and forest, especially primitive forests with rich of flora and faune. Aside that, natural gives the province many interesting sights such as Ba Be National Park, Dau Dang Waterfall, Ba Be Lake, Puong Cave. Bac Can used to be a cradle of Vietnam revolution so it has many revolutionary relics as ATK in there. Bac Can is famous for Ba Be Lake Spring Festival with many rituals and activities as boat racing, wrestling, dancing, nem con (con throwing). The festival attracts a lot of people around the region.